Mitchell’s wife, Byron Katie, said about him, “Stephen is brave enough to be married to the impersonal.” Maybe more and more people are becoming brave enough to regard the divine in impersonal terms, but there is still a craving for a someone or something “out there” that cares. We can't help it: we want the universe to be friendly. the leaves fall with gestures saying no. away from the stars into aloneness. And look at others: it is in all. with infinite gentleness holds in his hands. I wonder what Rilke would do with the knowledge that the universe is expanding, everything rushing away from everything else -- the line about the earth falling into aloneness seems prescient. While the notion of a “friendly universe” is consoling, deep down we yearn for more than “friendly.” We want the gentleness, the tenderness that with luck we’ve received from parents and lovers. We are less likely than in the past to see ourselves as wretched sinners in need of redemption; what we’d like is a loving god infused in the universe, a cosmic Santa Claus. That’s not the benign impression of the divine that I get from Kahlo’s 1949 masterpiece, The Love Embrace of the Universe, Earth (Mexico), Diego, Me, and Señor Xolotl. Oddly perhaps, I suddenly thought of Arab women praying at the Tomb of Rachel. The distinctions between Judaism and Islam were irrelevant to those women; what mattered was that Rachel was a mother. A mother is someone who cares. Much has been said about this painting in terms of mythology, both Aztec, Christian (Madonna and Child), and Hindu. Frida’s dog is named Xolotl, the guardian of the Underworld. But the dog is endearingly small and curled into himself, as if about to fall asleep on the brown forearm of the Great Mother. Diego looks rather comic as an oversized naked infant in Frida’s lap, but he also has the third eye of cosmic vision, maybe to signify that an artist is a visionary, a seer. Nevertheless, Diego is a “big baby,” regardless of his fame, and Frida needs the embrace of the Great Mother to help hold him. The painting could be described as being about love, and the embrace certainly seems to confirm it. Still, I see it more in the sense of “this is how things are” -- our task is to make the best of this impersonal embrace and live without resentment. It’s a letting go. I wrote the poem from a spontaneous waking dream that I had a few years ago when I was doing a lot of shamanic journey work. I had done a guided meditation in which I released my brother from my heart, and later this vision came, a whole crowd of men leaving single file, marching out like a small army. My body was like a submarine with a small hatch, and they twisted and wiggled to get out of it. The poem is pretty much a direct transcription of my vision. The vision astounded me. I had never realized that every man I had ever formed an attachment to was still imprinted in my heart, one man over the other. And at the bottom of it all was my father, dead at least 20 years at the time of the vision, but not yet ready to leave. I had to work so hard to push him out, and then he was too heavy to go to the light and fell back into me. It was a wonderfully liberating feeling to have the men leave, yet I have noticed that they have a way of coming back. I've seen all of them recently living in my house, my rooms transformed to army-type barracks where they are sleeping, some in suspended animation, partially awake. Adam born from under my ribs, then the second, then the third. There are men I recognize, men I can name, and men I can’t. squirming out, slipping through, walking off. I see Gene and Patrick and Joe and Jack, one behind the other. and some stay behind and take their time. let themselves out, move away. And some I'm glad to see again. I see who matters, and who doesn’t, and who really was The One. he’d stay in my heart until he was replaced, essentially erased. layer upon layer of men in my heart, so full, so cluttered, so taken up. comes back to the perimeter, hangs around saying nothing. I see Patrick sail off in his boat. The white sail on the ocean recedes. it was nice being in your heart all these years, it was nice in your love. I see him sail off in his boat again, see the white sail of him far far off. like trying with all my strength to expel a child. keeps falling back into my heart. I love the imagistic way in which this poem presents the complex psychological situation of emotional release – here compared to giving birth. If giving birth is, in a sense, what our lives are about, then the creation – including a lover whose life has been changed by us – must be released by the creator into the larger world. And it must be released with gratitude and a blessing. This poem is an excellent example of the power of what I call the "magical underlying metaphor": in this case, men leaving the woman's heart. The underlying metaphor sets up the narrative and the structure that allows the images to add up to a satisfying whole. But just when we think this is it: the ex-husband and the lovers leaving one after another, there is a surprise. There is a man who will not leave the speaker's heart. It's her father, destined to live on in her consciousness. Note how the poem does not try to explain away why the father keeps falling back into her heart. He's heavy, yes, but that has a larger meaning which the reader can develop according to his/her experience and understanding. We are left with the image and the mystery. And it's wonderful to end a poem on an image rather than an explanation. This is such a visual poem. And I love the reversal of the biblical story: here the woman is giving birth to Adam ("from under my ribs"), "and the second, and the third." True to nature, the woman-Eve gives birth to a multiple Adams. I also love the painting that Janet Baker chose to accompany this poem. Frida Kahlo holds her husband Diego Rivera in her lap like an overgrown, overweight, clumsy baby. And yet, aided by the cosmic embrace, she can hold him effortlessly, as part of the universal process. Funny, I’ve had fantasies of carrying a lover as a woman might carry a baby; a part of feeling the tenderness, I suppose. It seems that in life we alternate between accumulation and release. In later life in particular, we see that some of the past lovers are now irrelevant; we don’t have anything in common with them anymore; we’d never choose them again. The gifts they brought have been assimilated; the pain they caused may seem nothing now, a trifle, a laugh. It’s because we have changed, gone on a different path. But part of the reason we have changed is that we have received the gifts that each lover brought. With time, we come to see the gift as greater than the suffering that love also brings. Margaret Mead said that a woman needs three husbands: the first one in early youth to be a passionate lover; the second to be a good father; and the third to be a joyful companion for the older years. Rather than complain about growing older, may we always give thanks for all our joyful companions. And thinking about past loves, may we remember the gifts each brought. After all, that's what we kept, adding to our wealth. A personal note: I have also had a dream about my past lovers (though they weren’t exactly the actual men; they could also pass as “men in general”) gathered in front of me, looking somewhat sheepish, as if wanting reassurance that I don’t hold a grudge against them. I don’t remember what I said, but I do remember that I felt nothing but affection for all of them. One of your best. Your “cosmic Santa Claus” made me laugh and Janet's poem is a masterpiece!!! I admire Frida Kahlo and read her life story and it is so heart breaking to think anyone spent their life in that much pain. I do not always understand her paintings but find modern Spanish art something I just don't get. It's like the literature of magical realism -- I'm not fond of that either. Stephen Mitchell I admire immensely and have almost committed his Rilke translations to memory. I think in many it's Mitchell's voice we hear as much as Rilke’s. Interested in his "the ultimate intelligence of the universe" as god. His concept of surrender to whatever happens and bearing it with grace makes me think of your poem about forgiving that I like so much. Reading that interview made me more interested in Tao -- again. And this reminds me of my visit to a Taoist temple in Los Angeles. In popular practice Taoism is not exactly non-theistic. What struck me was the statue of Quan-Yin, the goddess of mercy. She got the most offerings of fruit and flowers. Frida would understand. Starts out with a great picture. Did you notice the Escheresque birds in the sky that are also clouds? 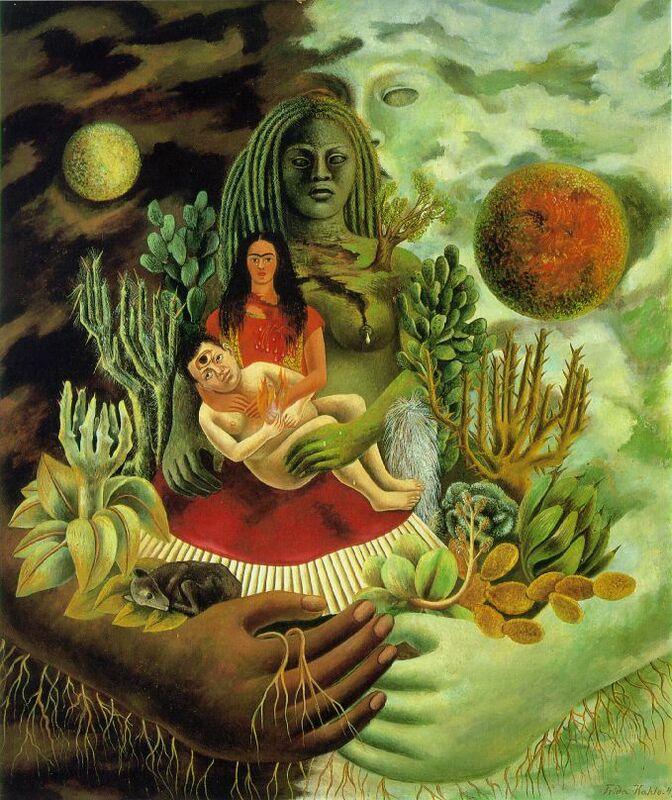 I interpret the image like this: Frida is holding an androgynous Diego Rivera, then Frida, then Frida's spirit, then the God of Nature with His/ Her hands embracing animal and plant kingdom. To me, the concept of God is pretty much irrelevant. I love watching the religious and atheists argue about who is right and who is wrong. What's more important to me than whether or not God exists are values and the concept of good and evil. Where do values come from and what is good and what is bad for me and humankind. You are so right about the Escheresque birds, especially on the left side of the painting! First I saw the dark birds, and then the light space also revealed itself as birds. Yes, Escher’s Night and Day. A brilliant observation. Religious beliefs in the sense of dogma seem so ludicrous now, so irrelevant in terms of the real challenges of life. And to think that people used to wage wars over whether the communion wafer and the wine became the flesh and blood of Christ in the literal sense, or only symbolically. Thousands were massacred over such absurdities. A person’s conduct, especially in terms of kindness, is a lot more important to me than arguments over the Virgin Birth, the Trinity, Purgatory, and so forth. It’s been pointed out that the Catholic Church gained its dominance by exterminating the opposition, especially the Gnostics of Provence. Martin Luther, however, had a powerful German nobleman protecting him, and attempts to assassinate Luther did not succeed. That, in a sense, was the beginning of the end. If you were allowed to think on your own, religion was doomed, no matter how slow the decline. The arguments between theists and atheists are a distant echo of an earlier argument. Literal or metaphoric? Or should we perhaps scrap the whole archaic foundation? After all, what matters in the end is not theology, but conduct. As for the origin of ethics, Rousseau’s idea of “social contract” appeals to me. We realize that life would be insufferable if everyone tried to steal other people’s goods, if cheating and lying and violence would be the norm, and so on. That’s why parents typically use the social-contract reasoning when they say to their trespassing little one, “How would you like it if Jimmy took your toy? Now, go to Jimmy, return the toy, and say you are sorry.” I don’t mean to trivialize the seriousness of ethics by giving this toddler-derived example; that’s the beginning of learning the Golden Rule that continues over one’s whole lifetime. Explanations of ethics in terms of empathy also make sense to me; it doesn’t have to be explicit “rational self-interest.” No one claims that humans are immaculately rational. We can identify with both the joy and the suffering of another, and laugh and weep with them. Now, evil . . . there is not enough space here to go into the problem of evil. But when I think of the Middle Ages, and how cruelty was the norm, I bless our imperfect but so much better modern reality. 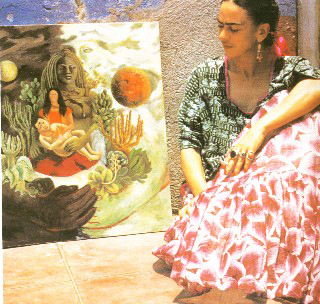 To return to Kahlo’s painting, regarded by critics as her last masterpiece: for me it’s ultimately about the importance of nurturing. Even the toy-snatching toddler is being nurtured rather than threatened with punishment, not to mention everlasting torment in hell. And Diego too is being nurtured by Frida. In turn, both of them are nurtured by the Earth and the Universe. Your blog is the best one I've seen. It is rich with art and your wonderful selections and commentary. Thank you! Yes, Janet's poem is "layered," memorable and so well crafted. Thank you for this wonderful feast of beauty and thought. I agree with Seretta. Your blog is so rich. Thank you for your generous comments. They keep me going. Janet Baker's poem "Men" is quite marvelous. What a great experience.